← You Could Have Fooled Me!! Sunday started out with frustration. I had gone to our storage unit with the intention of starting a purge. No, no…the Good kind of purge! I want to go through what’s in there, see what I can get rid of and possibly get rid of the unit itself. Anyone have any “free” storage space I can use?? Just kidding. But my problem was this. I usually have difficulty getting the lock open. That baby cooperated fully. I couldn’t get the door up! And of course, it’s Sunday…The office is closed…no one to help me! 😦 So I’ll be heading over there again after the office opens to try to get a handle on this. Today will be a good day for it since it won’t be so hot! 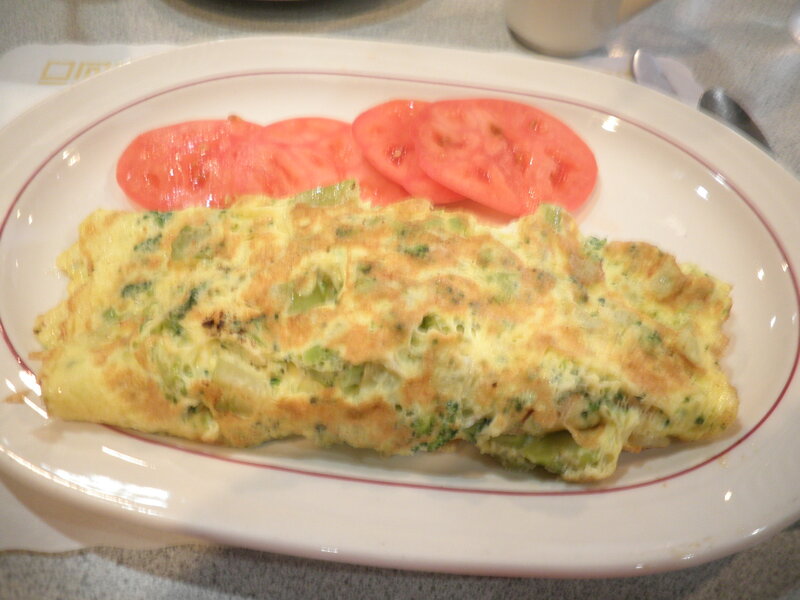 A broccoli omelette with sliced tomatoes. I’m really enjoy my eggs topped with the grated parmesan cheese. I still get some cheesy flavor with fewer Points…OK by Me! It was too hot to do much when we got back. I decided I would read. I was desperately trying to finish a book on which I wish I had NOT wasted my precious reading time. A Visit From The Goon Squad. I’m not even linking this because I don’t want to encourage anyone else to spend their money on it…I wasted a perfectly good Barnes & Noble coupon on it!! 😦 I actually would like someone I know to read it to see if they have the same reaction. The reviews on Goodreads all seem to be totally positive or totally negative. I know which group I’m in!! At least I didn’t notice any typos!! However, I was so confused by it, I’m not sure I would have recognized a typo!! Local Girls by Alice Hoffman… So far I’m really enjoying it. It’s short and just what I need right now. A book about people, with a good story. Thank you!! It’s an easy read and I’m almost half way through. Dinner was quick…had to get back to my Law & Order:SVU marathon! Good old salad in my good old Big Purple Bowl. Simple…romaine, green bell pepper, tomatoes, black-eyed peas (they’re lasting a long time! 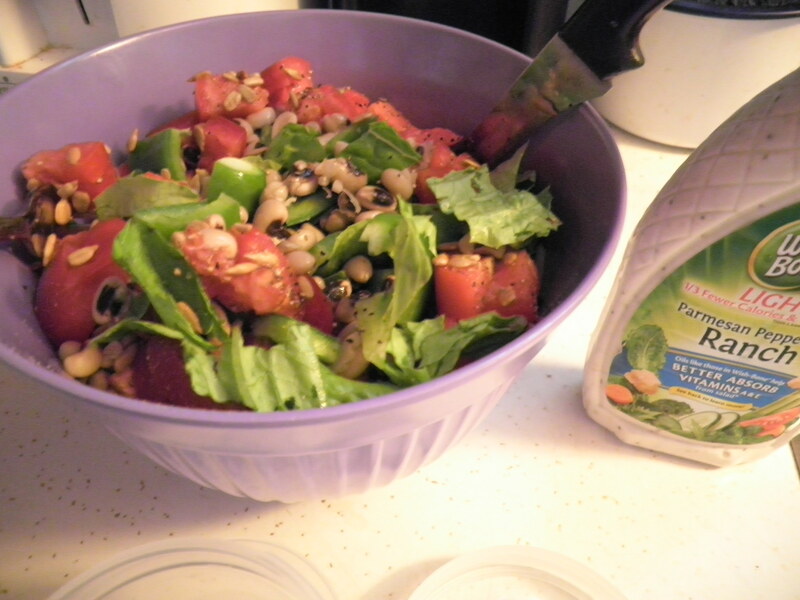 ), sunflower seeds and reduced fat parmesan ranch dressing. Very filling and followed later by a big bowl of the melons I prepared in the morning. I ate that while watching The Thing From Another World. One of my favorite scary movies! This entry was posted in Uncategorized and tagged Big Purple Bowl, books, fruit. Bookmark the permalink. Back at ya, Val!! Hope it’s cooling off out there in KCMO! !